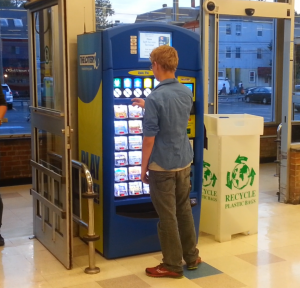 As part of its mission to end youth access to lottery ticket vending machines in Massachusetts, the Public Health Advocacy Institute (PHAI) announced today that it has settled a lawsuit with Star Markets. In March, PHAI, a non-profit organization based at Northeastern University, brought suit against the supermarket chain in the Massachusetts Superior Court on behalf of the Stop Predatory Gambling Foundation and Cambridge City Councilor Craig Kelley, who alleged that his teenage son had been able to use lottery ticket vending machines at two Star Market stores. Under the settlement, Star Markets commits to using an age verification device that the Massachusetts Lottery Commission recently installed on all lottery ticket vending machines in Star Markets’ Massachusetts stores. The device prohibits a person from using the vending machine until a driver’s license or government-issued identification card demonstrating that the user is at least 18-years-old is scanned.